Jack Weaver, who developed the stance that bears his name, passes away at age 80. but his legacy lives on. As the story goes, the late Col. Jeff Cooper and a bunch of like-minded shooters were participating in Cooper's Leatherslap competition back in the late 1950s--shooting from the hip as they blazed away at balloons less than 10 feet away. They missed. A lot. Then along came Jack Weaver, a Los Angeles County deputy sheriff. 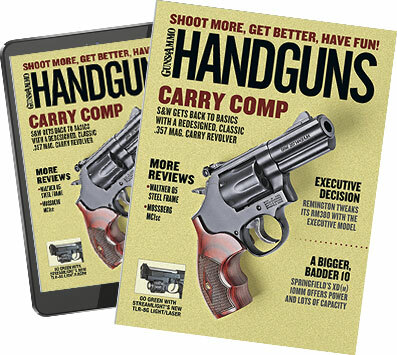 "Most of the talk was about how fast different contestants were; 'hundredths of a second' seemed very important," Weaver, referring to the first Leatherslap in 1956, wrote in the February 1994 issue of Handguns. "Nobody ever mentioned accuracy--that problem was somehow going to take care of itself, like all the Westerns on TV during that time." Weaver set out to find a better way, and when he showed up at Leatherslap the following year, he tried point-shooting with two hands on the gun, which he extended about 1.5 feet from his stomach. "It worked pretty good in practice but was a complete flop at the contest.&apos;¦A short time later I discovered that if I tilted my head down a little and brought the gun up a foot higher, I could see the sights. Eureka--something that worked every time and was still pretty fast!" The following year, Weaver won Leatherslap and won a lot of converts as well. It wasn't long before everybody was using what became known as the Weaver Stance--shooting with a two-handed grip in which the firing hand pushes forward as the support hand, which is wrapped around the firing hand, pulls back. At the time, though, the inventor himself hadn't really given the details a whole lot of consideration. "No thought was given to foot position, recoil control or pushing with one hand and pulling with the other," Weaver wrote. "I found out all kinds of things about myself that I didn't know until I read them in gun magazines.&apos;¦I had to go out and fire a few rounds to see if I really did push the right and pull the left arm--sure enough!" Weaver's two-handed, shoot-with-sights style was adopted by both Jeff Cooper for the Modern Technique and embraced by the FBI. Col. Cooper was so impressed with the Weaver Stance that he made it one of the foundations of his famed Modern Technique. The FBI was so impressed that in 1982 it embraced his technique after an in-depth study of handgun shooting, calling it the "quickest 'on target' technique with first-hit capability, as well as having the weapon remain on target after recoil." "The important thing is the hand position on the gun (no wrist grabbing or palm-under-the-hand stuff)," Weaver wrote in Handguns. "I put my left thumb over my right and squeeze tighter with my left (weak) and than the right&apos;¦The rest is up to the individual. Unless you are a Jack Weaver clone, you can't be expected to do everything exactly like I do." "So, my free advice is: Practice, experiment, shoot in competition, stick to one gun, one style (no last-second decisions) and don't wait until you're in a shootout to find out what works and what doesn't." The father of the Weaver Stance died at his Carson City, Nevada, home last April. He was 80 years old.